Winston Churchill once cautioned that “[w]e are stripped bare by the curse of plenty.” His description is still fitting for how mineral wealth impacts developing nations, particularly in Africa. That continent holds about one-third of the world’s mineral reserves, and African countries comprise six of the ten most resource-dependent, some with resource GDP exceeding 50%. Government reliance levels can be even higher. Resource taxation as a percentage of total revenue lies at 70% and 79%, respectively, for Nigeria and Angola. If officials can fund their administration through mineral wealth, they are not as concerned with being able to collect taxes from citizens. No matter how badly they govern, mineral revenues continue to flow into the treasury. The practical result is that the quality of basic services tends to decline. As such, there’s a strong correlation between resource dependency and weak nations. “Fragile and conflict” countries have an average resource GDP of one-third — while the world averages only 5%. When commodity prices are high, the coffers of resource-rich governments overflow. This often leads to a spending spree that distorts the economy and sets the stage for the curse. Inefficient spending may include patronage (both in bureaucratic hiring and government contracts), protection (military/security), entrenchment (manipulating elections), white elephant projects (sports stadiums and the like), and even, outright embezzlement. Energy companies have struggled to address the resulting impact. A typical response has been construction of “community projects,” such as schools and clinics. In my travels around thirty African nations, I have often seen ruins of do-good facilities, which were too expensive for communities to maintain. More recently, though, energy companies are taking a new approach — using such funds for lending to community entrepreneurs. In Nigeria, for example, an LNG project has made millions of dollars in microfinance loans to businesses in the agricultural, retail, and services sectors. Loan repayment rates are exceeding 90%. The challenge is expanding such community-level success to a national scale. I have advocated doing so through a royalty-based approach. Nations could reserve 1% of mineral proceeds for funding loans to its citizens. In addition to the entrepreneurial lending that has worked in Nigeria, educational lending also merits consideration, as it strengthens other economic sectors by improving the workforce skill level. Lending itself – whether for businesses or education – is particularly attractive because it is sustainable. Even if the country’s natural resources are exhausted, loan programs can continue indefinitely. What is needed now is a nation to lead the implementation of such programs. The United States already spends $30 billion a year on foreign economic assistance, with Nigeria alone receiving $500 million a year. Rather than indefinitely treating the symptoms of the resource curse, perhaps some of these funds would be better spent working to eliminate it altogether. The United States also could condition foreign aid on the adoption of royalty-funded lending programs. Given the recent collapse of commodity prices, governments again are being humbled by the resource curse. Maybe this time they will be more receptive to an alternative — one that invests in their future generations. Meeting earlier this year with H.E. 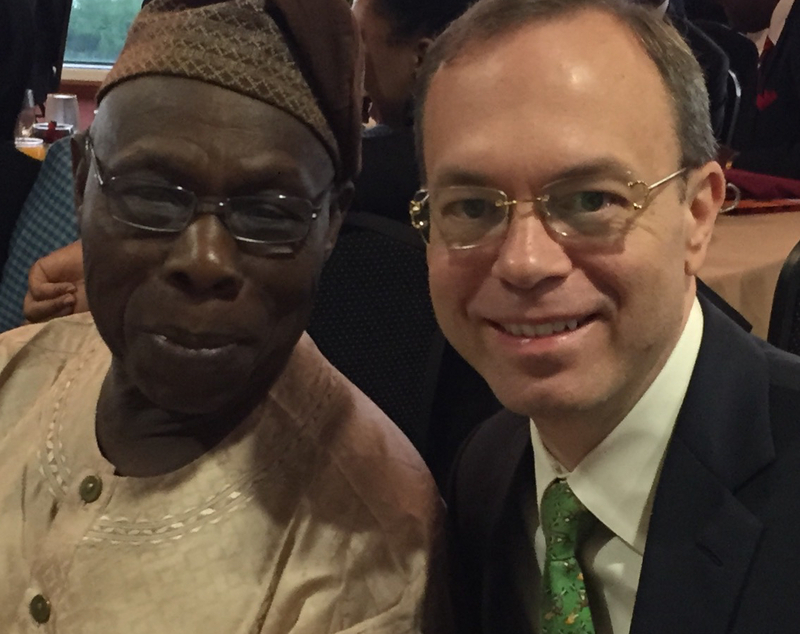 Olusegun Obasanjo, the former President of Nigeria, where energy companies’ lending programs offer promise for mitigating the natural resources curse.